Pohnpei—This week the Pohnpei State Government hosted a high level delegation from China’s Hainan Province to discuss agriculture, tourism, fisheries issues and other matters. During their time here, Governor Marcelo K. Peterson and FU Caixiang, Vice Governor of the People’s Government of Hainan Province signed a Memorandum of Understanding (MOU) for the joint establishment of a Coconut Standardized Planting Demonstration Park in Madolenihmw. The signing ceremony was held at the Governor’s conference room in Peilapalap. Later that afternoon, they held a ribbon cutting ceremony for the project that will cover 1.33 hectares of land adjacent to the China demonstration farm in Pohnlangas, Madolenihmw. The China demonstration farm has been operating in Pohnlangas for 20 years. 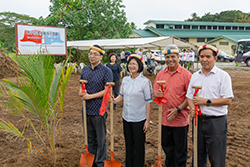 This afternoon, after the speeches were completed, dignitaries from Pohnpei and Hainan each took turns with spades around four small coconut plants in a small cleared area for a ceremonial turning over of the soil. They then gathered for a ceremonial ribbon cutting and photo opportunities. The Pohnpei State Government and the Hainan Provincial Government have agreed to work cooperatively on the coconut demonstration planting project. 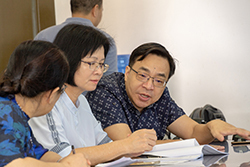 Both parties appointed the Chinese Academy of Tropical Agricultural Sciences (CATAS) to take the lead in establishing the planting demonstration park. 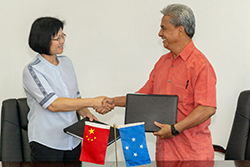 The MOU says that the Hainan Provincial Government will support the agricultural training needs of Pohnpei to help train “agricultural technicians”, and that both parties would conduct cooperative research on areas of common interest related to the project. The Hainan government and the Pohnpei government have agreed through the signing of the MOU to establish a joint agricultural working group to liaise with each other for implementation of the project. Pohnpei Department of Resources and Development is the executing agency for the State of Pohnpei. The MOU is for five years that will be automatically extended for another five years unless one party notifies the other in writing that they intend to terminate the agreement six months prior to its expiration. Visiting Hainan Provincial Government officials who visited included Ms. FU Caixian, Vice Governor; Ms. SI Haiyang, Deputy Secretary General, Ms. MIAO Yanhong, Director General of Department of Civil Affairs; Mr. HAN Jinglei, Division Director of Foreign and Overseas Chinese Affairs; Mr. Xiao Feng, Deputy Division Director of General Office; and Ms. LIU Liu, Principal Staff Member of Foreign and Overseas Chinese Affairs. The entourage also included photographers and other staff members.